Honolulu is famous for being an incredibly unique place. 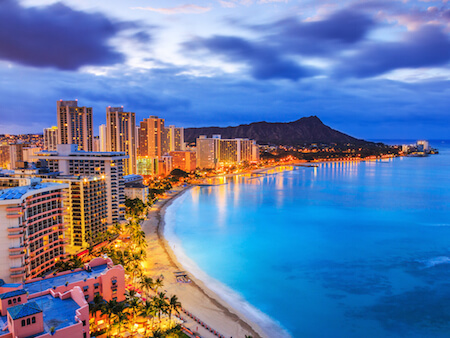 As the biggest city in the Hawaii, Honolulu has everything to offer visitors — from one of the most iconic beaches in the world to dormant volcanoes, snorkeling, surfing, and everything in between. Here are a few things you cannot miss on your visit to Honolulu. It’s been in countless movies and the inspiration for many songs — but you won’t believe how great Waikiki Beach is until you see it for yourself. With eight different sections boasting unique offerings, the area is home to Kapi’olani Park, Fort DeRussy, Kahanamoku Lagoon, Kuhio Beach Park, Ala Wai Harbor, and so much more. It’s incredibly popular for swimming, as the protective seawall around the beach keeps the water calm. Sit back, relax, put on extra sunscreen, and watch as the crowds and waves roll in and out. There's also Hanauma Bay and the Halona Blowhole with 30 ft geysers. Check it out on an Oahu Circle Island Adventure Tour. Or maybe you’re looking for something more explosive. The Hawaiian Islands have three volcanoes, and the Honolulu volcanic series is in, you guessed it, Honolulu. Created between 800,000 and 300,000 years ago, the volcano set continues to be at the center of the island’s attention. Diamond Head, known to locals as Le’ahi, is the famous tuna fin-shaped ridgeline that rises up behind the city. While much of it is closed to the public, the Diamond Head Trail is one of the best hiking experiences on the island, and also boasts one of the best views of the Oahu. Now that you’ve trekked up, down, and around the area’s natural wonders, how about some history? The city has plenty of historical sites to keep visitors interested, reflecting its history from the Hawaiian monarchy that ruled it for centuries to the island’s pivotal role in WWII. First, start your history tour at the Iolani Palace State Monument. This palace in Downtown Honolulu was dedicated in 1882, and it is the only official state residence of royalty in the USA. It now acts as a museum, and educates and entertains countless visitors every year. Just across the street lays the King Kamehameha I statue, rounding out your Hawaiian history lesson. Of course, a visit to Honolulu is just not complete without a stop to Pearl Harbor. Known as the home of the USA’s entry into WWII, this site includes the WWII Valor, the USS Arizona Memorial, Punchbowl National Cemetery of the Pacific, as well as several other monuments. There are several Pearl Harbor tours available including USS Arizona Memorial & Historic Honolulu Tour and WWII: Honor the Heroes & Historic Honolulu Tour. Enjoy your stay in Honolulu, and don’t forget to call us to take care of all your transportation needs on the island — from airport pick up to drop off. Reserve transport from Honolulu to Waikiki or anywhere your vacation takes you. SpeediShuttle offers airport transfers throughout Honolulu and tours with IMI Tours. There are also a few things you should keep in mind before your Hawaiian travels and Honolulu transportation. Honolulu is a safe place, with welcoming locals and a strong tourist infrastructure. That being said, it is always good to be wary of your surroundings and exercise best judgment, especially if you’re traveling alone. If you plan on doing any hiking or natural excursions, be sure to follow local guidelines and keep a charged phone with you. It’s also always a good idea to let people know where you are if you are going off on any island adventures. When packing, there are a few things you need to keep in mind. Depending on the season, Hawaii can become incredibly hot. You should make sure to pack light clothes — and of course a swimsuit! Nights can become cool, so bring a sweater. It’s always a good idea to research the forecasted weather before packing. If you want to take part in Oahu’s many natural attractions, be sure to pack suitable clothing. You don’t want to take the Diamond Head Trail on in sandals! Finally, Hawaii is an incredibly popular tourist destination, and Honolulu is no different. Traffic is often an issue on the busier islands, and local transport can be expensive if not planned ahead. Leave the stress to us! We have a fleet of vehicles of all sizes to ensure you and your group, no matter the size, gets to and from your destination safely, comfortably, and with air conditioning! If you're staying in Honolulu, popular hotels include Ala Moana Hotel, Prince Hotel Waikiki, Hilton Waikiki Beach Hotel, Pearl Hotel Waikiki, Hilton Hawaiian Village, Waikiki Beach Marriott, Aston Waikiki Beach Hotel, Pagoda Hotel, and more. Honolulu is also popular for designations weddings. Just about every resort makes for an incredible wedding venue. Some of the most popular wedding spots include the Prince Waikiki, Bayer Estate, The Kahala Hotel & Resort, Hyatt Regency Waikiki Beach, and Moana Surfrider. Besides airport transfers, SpeediShuttle also provides charter wedding shuttles in Honolulu and Honolulu transportation for special events throughout the island. Ask us more about all of our SpeediShuttle resorts services in Honolulu - 1-877-242-5777. Remember to reserve your Honolulu Airport Shuttle and Oahu Tours with SpeediShuttle! You can also reserve private charter shuttles in Honolulu for any occasion... perfect for large groups traveling together. We also offer HNL airport shuttles to hotels and more in Honolulu!